Residents of Isle au Haut (above) and other Maine outposts use housing grants to attract neighbors and preserve communities. ISLE AU HAUT, Maine — The 40 year-round residents of this remote, wind-swept island about six miles off the Maine coast are looking for some adventurous souls to join their community, contribute to its civic life, and fill the one-room schoolhouse with children. 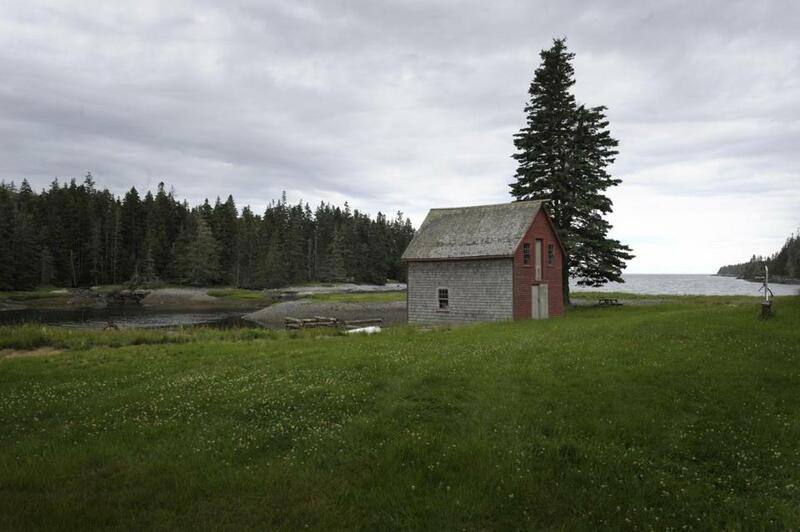 To woo new neighbors, Isle au Haut’s leaders have secured a $355,000 state grant to build two affordable rental homes — one amidst blueberry patches and spruce trees, the other offering glimpses of the rocky coast — for families of four earning less than $70,000 a year. The housing plan is part of a $3 million statewide initiative to use affordable housing to bolster Maine’s year-round island communities, which have dwindled from about 300 to 15 over the past century. Nine islands — from Peaks Island off of Portland to Great Cranberry Island near Acadia National Park — are in the process of building affordable single-family or duplex homes. Many once-robust island populations suffered with the proliferation of the motor boat in the early 1900s — which allowed fisherman to live farther away from their catches — as well as the growth of railroads, which trumped ships as the preferred method of commercial transportation. As an earlier generation of lobstermen died, families sold waterfront properties to out-of-state summer visitors, raising real estate values and leaving homes vacant and dark for much of the year. Without year-round populations, the islands are more vulnerable to theft and vandalism. “There are 5,000 residents that care passionately that these communities exist and they are willing to work incredibly hard to make it happen,’’ said Rob ­Snyder, executive vice president of the Island Institute, a Rockland nonprofit that championed the affordable-housing funding. Isle au Haut — about six miles from the mainland via Stonington — has particular challenges because it’s one of the state’s least populated atolls. The campaign to attract new residents includes a website, www.isleauhaut.org, and a media push through local newspapers and trade magazines. The island is six miles long and two miles wide, and more than half of it is part of Acadia National Park, which is largely on Mount Desert Island to the north. Thousands of visitors take the 45-minute mail boat and ferry service from Stonington to explore Isle au Haut during the summer, when the island population expands to about 300. But in winter, life slows drastically and the ferry operates only six days a week. Islanders mostly earn a living through fishing, carpentry, or landscaping — and in some cases, a combination of all three. A small number have launched new businesses, including a chocolate company, with the help of the US Postal Service and high-speed Internet. 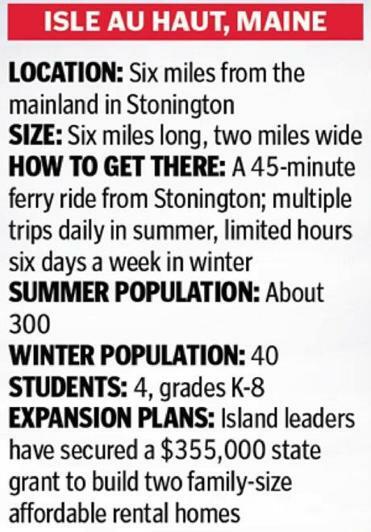 But islanders worry that if they lose the school, the year-round population will go with it. Currently, only four students, all boys, attend the kindergarten through eighth-grade facility, so even one or two new families could make a difference. Additional residents could also boost the school council, the volunteer fire department, and turnout at the multigenerational Wednesday night volleyball games held inside a community room in Town Hall. 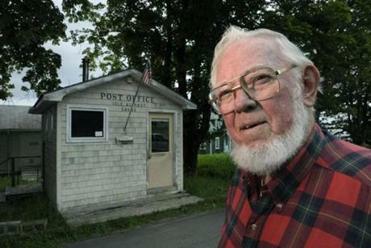 The town is run by a three-member board of selectmen. There are no restaurants, no inns, and one tiny grocery store. The school has one teacher, an aide, and several other support staff who arrive by boat daily. Lobsterman Billy Barter, 74, grew up on Isle au Haut, married one of his schoolmates, Bernadine, and has two great-grandsons in the school. He wistfully remembers when there were 100 full-time residents. Bernadine, 73, is known as the “island greeter” because she likes to go to the dock and welcome visitors. The Isle au Haut Community Development Corp. was created about 20 years ago during an initial push to attract people when the school population dropped to a single student. Wurzburg said the organization built three houses, one of which became the Shaffers’ home. The new initiative includes a three-bedroom house that will rent for $750 a month and a two-bedroom property that will cost $600 a month.The state is providing $355,000 toward the project and the island is raising additional money through special events, including a July Fourth pancake breakfast and a mini-triathlon. The nonprofit Genesis Community Loan Fund, based in Damariscotta, is helping all of the islands get low-cost loans for additional expenses. It doesn’t take a major influx to create an impact in a place like Isle au Haut. For instance, Kendra Chubbuck, 58, moved to the island in January ­after getting engaged to lobsterman John Dewitt, 58, and has already opened Shore Shop Gifts, a few minutes from the town dock. Chubbuck sells Maine-made jewelry, T-shirts, and books to visitors and, soon, to online shoppers. This spring, Diana Santospago, 54, started operating a food truck, called the Maine Lobster Lady, catering largely to the summer population. Santospago said she is excited about seeing a few new islanders but hopes they don’t come with idealized visions of what life will be like. In fact, Santospago leaves during the winter to sell lobster in Phoenix. Kate and Steve Shaffer first spent time on Isle au Haut in 2001 and moved full time to the island in 2004, with the help of a state affordable housing grant that cut rent for their four-bedroom house to $400 a month. Their business, Black Dinah Chocolatiers, grossed about $250,000 last year. Kate Shaffer knows it would be cheaper to do business on the mainland, without the shipping costs, but she wants to help keep Isle au Haut viable. Last year, the couple purchased the property they were renting and turned the barn into a commercial kitchen.